Because they are beautiful and important with a rich and interesting history. My second career choice was typographer but I didn’t have the skills or resources to do it - much like my first career choice of Pro BMXer. Software development was third choice and far more realistic. That explains it ;) I’m no font connoisseur (hence why I’ve stuck with Courier New when coding for years and never even noticed) but I have been frustrated by the lack of freely usable standard font replacements - when distributing OGRE (which uses some TTFs) we had to hunt around for decent standard-looking fonts we could distribute because the MS free fonts license wouldn’t let us. So this is a good thing. My only strong opinion on fonts generally is that Comic Sans really irritates me. A certain personnel department insisted on using it and it just looks ridiculously unprofessional and ‘My First Website’y. I know serif fonts are out of fashion now but in print (rather than the web), they are much better IMO. There’s a reason Times has been around so long..
ugh! the liberation mono is certainly no replacement for courier new imo. Damian, Your being a typeface cognoscente, why do you use Arial, the ugliest font of the all below 17px, as well as, the least legible? Furthermore, why did you pick the bizarre color “6a604f”, causing severe eyestrain in lowly mortals due to extremely low contrast? Ah I assume you mean the blog look and feel. It’s a standard termplate that comes with my blogging software. I am working on a look of my own. The first check that I perform when choosing a monospaced font for programming is whether I can differentiate between a 1 (one) and an l (lower-case L), and between a 0 (zero) and an O (upper-case O). The monospaced Liberation font fails these tests. The font may look nice, but it’s useless for programmers. 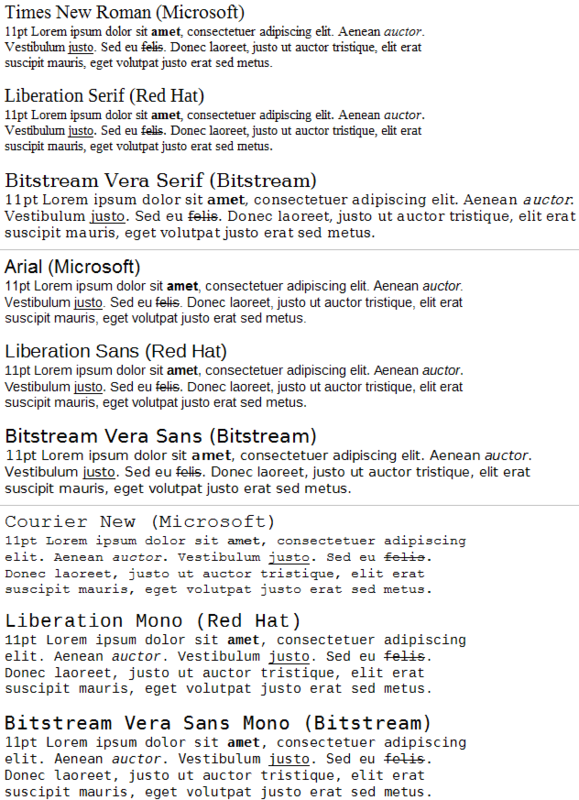 During my days as a code-monkey I used a bitmapped Lucida Sans Typewriter for programming and have recently switched to Bitstream Vera Sans TTF once Emacs on OS X supported AA fonts. 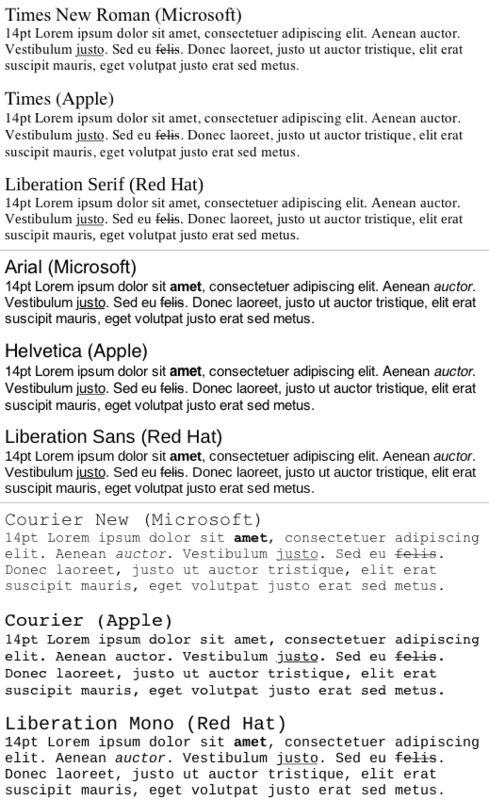 Red Hat’s site has been updated with the latest version of the Liberation fonts, which includes full hinting and a distinguishable zero in Liberation Mono. It’s now become my default coding font.